According to the Centers for Disease Control and Prevention, last season overall deaths attributed to flu and pneumonia were the highest in nearly a decade. People 65 years and older accounted for half of all flu-related hospitalizations. Seniors and people with chronic health conditions such as asthma, diabetes and heart disease are at a higher risk for serious complications from the flu. The flu virus can live for up to 8 hours on a hard surface. Clean hard surfaces in the home with an antibacterial solution. Wipe down surfaces such as telephones, doorknobs and electronic devices. As long as you keep your home disinfected, you can wipe out the virus before it has a chance to make everyone sick. Don’t share dishes with a sick person. Wash dishes with hot water and soap. Wash bed linens frequently and change pillow cases nightly for an ill person. Wash linens in HOT water and dry on HIGH heat. Cover your nose and mouth with a tissue when you cough or sneeze and throw the tissue away after you use it. Don’t go to work or school while you’re sick. Stay home until at least 24 hours after you no longer have a fever without the use of a fever-reducing medicine. 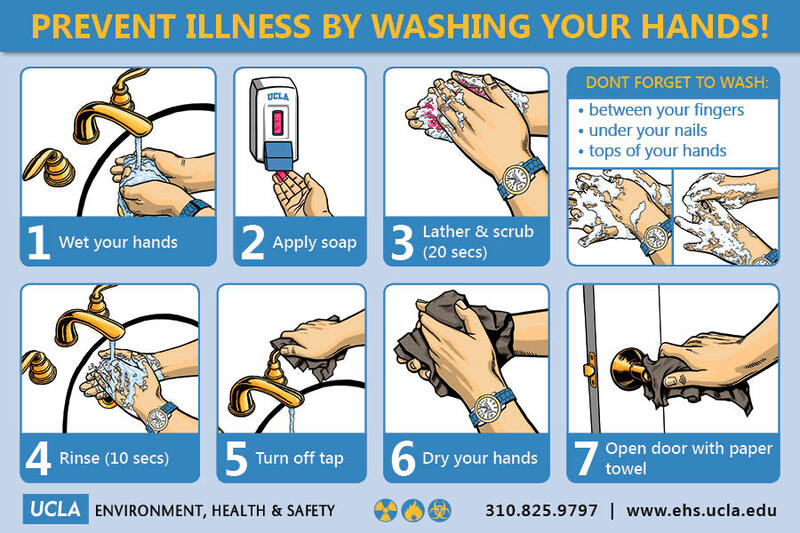 Washing your hands is the single most effective way to prevent transmission of the flu virus. Who needs to get a flu shot? According to the CDC, everyone 6 months of age and older should get the flu vaccine. Get the vaccine as soon as it is available in your area. Flu season usually peaks in January or February, but it can occur as late as May. Early immunization is the most effective, but it is not too late to get the vaccine in December, January or beyond. How long will the vaccination protect me? The flu vaccine will protect you for one flu season, and is designed to protect you from the strains of flu that are expected to circulate that flu season. Except for some children and older adults, only one dose of vaccine is needed every year. Will the vaccine protect me from all types of cold and flu viruses? Flu vaccines will not protect against infection and illness caused by other viruses that can also cause flu-like symptoms. There are many other viruses besides the flu that can result in flu-like illness that spread during the flu season. Does the flu vaccine work the same for everyone? The flu vaccine is the single best way to prevent the flu, and vaccination is the main tool used to protect people from the flu. However, protection is never 100%, and some people can still get the flu after being vaccinated. If you do get sick, get plenty of rest and drink clear fluids like water and soup broth. Those 5 years of age and older can take medicines such as acetaminophen (Tylenol) and ibuprofen (Advil, Motrin, Nuprin) to relieve symptoms. Don’t give aspirin to children or teenagers who have the flu – this can cause a rare but serious illness called Reye’s Syndrome. Does Medicare cover flu vaccinations? Generally, Medicare Part B covers one flu vaccination and its administration per flu season for Medicare beneficiaries without co-pay or deductible. The flu vaccine is NOT a Part D-covered drug. Where can I find a flu vaccine provider in my community? HealthMap Vaccine Finder is a free online service where you can search for locations that offer flu and other adult vaccinations.